One of my good friends introduced me to Austerlitz back in June. We were discussing which book we’d be interested in buddy-reading (read-along) next and he suggested this. He said it was about memory, and identity. As soon as we both had copies, we dived right into it. 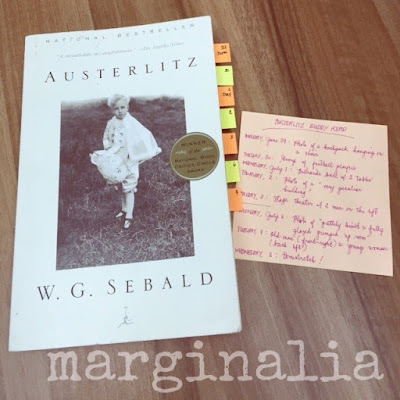 Austerlitz is the name of the main character – full name Jacques Austerlitz – whose story is told to an unnamed narrator. The latter meets Austerlitz at the Antwerp Train Station, a total stranger, who then begins to narrate the story of his life – the fragments of it that he could remember. Austerlitz speaks of his childhood, of life as an adopted child of a minister and his wife, of answering to no other name than “Elias” until he goes to school and learns of his true identity, of his ongoing quest to find and reclaim his past and true self. Austerlitz is a despondent, depressing tale of a young boy whisked to safety via the Kindertransport, away from his parents, in order to escape the clutches of Nazi Germany. As with all Holocaust stories, this novel is another depiction of the atrocities that the Germans perpetrated decades ago. This one is gutting because it showed the effects of the Nazi invasion of Europe to children, to their sense of self and identity, to their memory. The effect is long-term, and scarring, and irreparable. There was much inclusion of architectural works and terms in the narrative. I didn’t pay much mind to it until my friend pointed out that perhaps, it was a way of portraying the protagonist’s mindset as he attempted to piece together his past, or the way his mind works now that he has discovered fragments of his life. In any case, the various historical trivia weaved into the story were quite interesting. "I have always resisted the power of time out of some internal compulsion which I myself have never understood, keeping myself apart from so-called current events in the hope, as I now think, said Austerlitz, that time will not pass away, has not passed away, that I can turn back and go behind it, and there I shall find everything as it once was, or more precisely I shall find that all moments of time have co-existed simultaneously, in which case none of what history tells us would be true, past events have not yet occurred but are waiting to do so at the moment when we think of them, although that, of course, opens up the bleak prospect of everlasting misery and neverending anguish." There's much to love about the profundity of the writing, especially the parts where Austerlitz was describing his friendship with Gerald in school. Unfortunately, while the storyline was continuous, as the whole novel was practically one long, winded paragraph, it did not flow. The structure – or lack of it – was both distracting and boring instead of compelling. The photographs that were interspersed with every few pages were presumably put there not only to serve as visual aids but also to signal breaks in the reading, and I have to admit that they helped. A little. But the narrative was plain exhausting to wade through. Still, I cannot deny that the beauty of historical fiction will always win over bad structure. Imagine the thousands of children spirited away to various destinations aboard the Kindertransport, off to uncertain futures and new lives, forced to shed old identities and embrace new ones. For that, and for the depressing moments I’ve had to endure, I appreciate this book. I will have to recycle my posts at our thread to come up with a review for this book. And I love love love the new look! Buddy: It's hard to write something when you've read the book some weeks back, but we can try. And thank you! Ginanahan akong mag-blog when I changed templates, haha!